Thank you for posting this information about DKS. I had never heard about this disease, but it totally explains what my Chaco golden knee sling was going through. Her cage lid was ajar and she escaped for about a month, and after I found her, and got her settled back in her cage. She began to shake like yours in the video. She was shaking like this up until she died a week or two later. Awwww…so sorry to hear about your Chaco golden knee. Watching a tarantula go through these symptoms is really difficult. It’s possible that while your sling was out, she got into something (like residual pesticides or household cleaners) that caused it. It’s even worse that you found it only to lose it like that. I’m so paranoid now, that if I drop a cricket on the floor while feeding a T, I won’t feed that cricket out. We have three dogs that we treat for fleas and ticks, and I’m so afraid that some of those chemicals will get transferred to my tarantulas. I’m so glad that my video helped. I did NOT enjoy taking that footage, but I was hoping that it might help others. Oh man. I am so sad reading this. My rosehair molted last month, on her stomach no less. It was the first time she ever did this. Her molt went very well, and she ate a fantastic first meal ten days afterward … and then she started rearing up a bit. I put her in a little plastic tank while I scrubbed hers, because I found some mites in it. Now she is in a completely sterile, fresh cage, with fresh, baked dirt, and she is still acting funny. She keeps lifting her legs up, like her feet hurt. She is not jerking around or anything, but from what I am reading, this may be the beginning of DKS. I am beyond sad right now. She has two crickets in her cage, and for the first time in her life, she is not eating. I am upping humidity, but in the even that she becomes worse, I am going euthanize her. I cannot let her die an agonizing death. How long have you had her for? I wouldn’t panic just yet. Wait it out a bit and see if the signs worsen. For my insubtilis, it progressed VERY quickly, and the symptoms were very obvious.By the time I began to consider euthanize it, it was dead. Keep in mind that G. roseas (“rosies” or “rose hairs”) can be prone to fasting, especially during the winter months. She could just be taking some time off eating because her body is telling her that it is winter, and food should be scarce. Never let a G. rosea not eating worry you, as they are literally infamous for their fasts. Some have reported their specimens not eating for over a year! I’ve had my rosehair for 19 years, and she likes it bone dry. I would not advise increasing the humidity at all in this case, as it will only serve to stress her. If she’s not eating, keep her water bowl full and try her with a cricket every two weeks or so. If she doesn’t eat it within 24 hours, take it out. They can go a long time without eating, so don’t worry about her starving or anything like that. As for the strange motions that you’re seeing, it could be part of the normal stretching out process they go through after a molt. They can also do this when they have something on their feet. Keep an eye on it and see if it could just be “normal” behavior. If it turns out to be DKS symptoms, it will be quite obvious, and you can make the decision to euthanize then. However, make sure that she is indeed in trouble before you take drastic steps. How would you euthanize a T? The most humane method is to freeze it. Supposedly, they just shut down and eventually die. Still, that should be a last resort and only if the animal is suffering. I’m sorry to read about your loss. I lost a juvenile Brazilian White Knee to DKS about a year ago, and I agree, it’s awful to watch. I tried so hard to save her but she couldn’t beat it. It’s been a year, but I’ve only just decided to get another. And I’m very sorry to hear about your Brazilian White Knee. I have several tarantulas, but I’m still bothered when I lose one. Having them show symptoms of DKS is particularly hard. I hope you have better luck with you new acquisition. Thankyou sooooo Very much for sharing this. My husband and I decided to get our middle daughter 14 yoa a tarantula for A honor roll this year! My husband and I have had a cpl rose hair in the past and thought this would be a wonderful first tarantula. 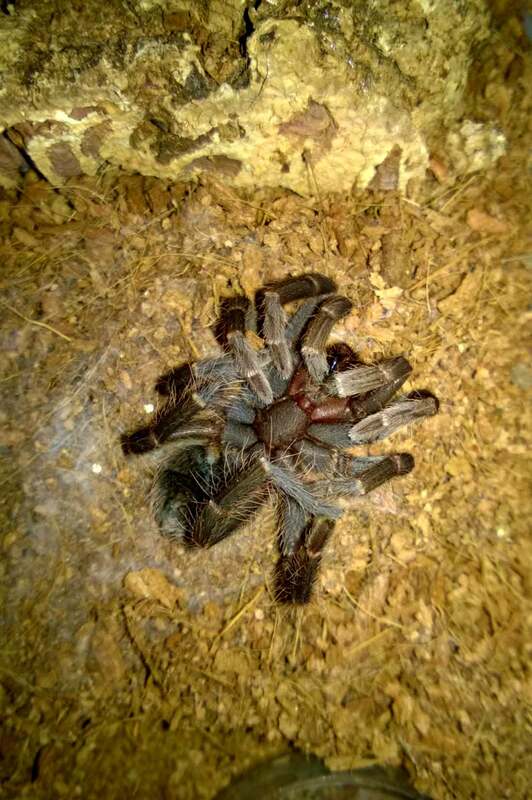 We got her tarantula from an older lady who had lots of “different ” kinds of pets at one time and since she was getting older got rid of them and this was her last “baby”. She told us it hadn’t eaten for awhile and she strictly fed it beetles and insects from her garden, I was not concerned at the time but it’s been 7+ minutes nths since getting then tarantula and it has not eaten once. It recently molted and now is December. Other then the fact that it has not eaten it’s a very healthy and active T. I feel much better reading this thread as DKS sound horrifying. And to some t may be strange but “Bonnie” the Tarantula is like what most kids consider their dog or cat to her. She loves this tarantula and it may sound crazy but it likes hanging out she on her. When she tries to put it up it wants to be on her. I know it sounds impossible but I swear they have bonded. The only time Bonnie the Tarantula ever seems stressed is when we put food in the cage and she isn’t interested and it goes around her(the T) ,that’s the only time she’s(the T) finicky. What great parents! I get a lot of kids emailing me because they are not allowed to have them and are trying to convince their parents to allow it. Rose hairs are notorious for not eating, so I definitely wouldn’t worry. If she just molted recently, then I would guess that she start eating again soon. I know of a keeper whose rosie didn’t eat for over 16 months! I have a G.Porteri that didn’t eat for 20 months, then she surprised me one day in September this year and ate a cricket and she hasn’t eaten again since, so that’s one cricket she’s eaten in 2 years and 2 months! Should I be worried? I am a little bit concerned, although she drinks regularly and her abdomen hasn’t shrunk at all in over 2 years. She hasn’t moulted for 2 and a half years either. I handled her for the very first time yesterday, there was a bit of a crisis when she got one of her claws stuck in the wire mesh lid which left her dangling from the lid, so I had to carefully remove the lid and turn it over and I let her walk onto my hand. She didn’t freak out at all but she did make it clear that she would rather be on familiar ground so I gently put her back. I am so sad to to see this video. I recently lost a phormictopus sp green. It was acting in the same exact way as yours before it died. I watched it for days just contorting and falling over….it was horrible. Now i know after seeing your video that my T had DKS. I hope to never experience that again. Thank you for the info. Awwww…I’m so sorry to hear about your Phormictopus sp. green. Did it get exposed to any chemicals or anything? I wracked my brain to try to figure out what could have cause this with mine, but never figured it out. Yes, it’s absolutely TERRIBLE to witness. My G. Pulchra sling acts JUST like this, however is still eating but now only prekilled crickets where as before would kill it on it’s own. Is it possible that they can molt out of this?? h/she hasn’t been to exposed to anything that I know of, but again it’s possible as I have dogs and do use the front line flea control. Love your insight, blogs, etc. so I appreciate any insight. Thanks! Meagan! I’m so sorry for the late reply!!! If it’s still eating, it might be something else. How is it doing now (I hope that it’s okay)! You can send me an email if you’d like (tomsbigspiders@outlook.com). My Aphonopelma hentzi (Texas Brown Tarantula) started doing moving like it has DKS this morning. He’s is a mature male, and I know they often don’t live long, but I’m trying to figure out what I can do to help him. I’ve read about ICU’s but I feel like that would give him too much stress for the good that it could do. I’m wondering if I should attempt to feed him, or if I should put some damp paper towel in his cage to increase the humidity. He was given to me one month ago from a friend who found him in the Oklahoma panhandle. This is my first T, and I was hoping to keep him alive over the winter and maybe release him next year.